We take great pride in the quality and workmanship of our merchandise and want you to be completely satisfied with your purchase from B2C Jewels. B2C Jewels offers free shipping on all orders within the United States. No sales tax will be charged on your order (*except in NY, NJ, PA, WA state). For your peace of mind, all B2C Jewels items are covered by a 1-year warranty. We are committed to serving our customers not only for a sale, but during a lifetime. B2C Jewels is committed to offer the best price available on certified diamonds. 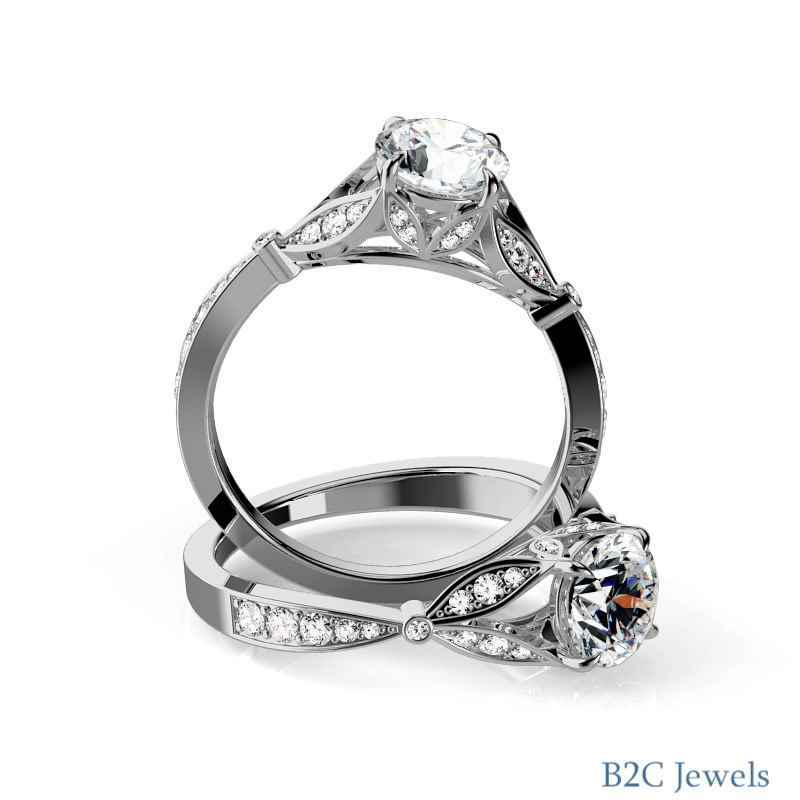 B2C Jewels realizes the difference between browsing for rings online and trying them on in person. 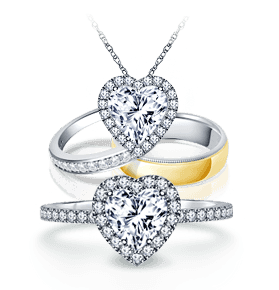 As we want our customers to be completely comfortable in buying their engagement ring online, we have introduced our "Try It For Free" service, where we send you exact replicas of rings you are interested in. This free* service lets you try and see up to 3 rings in person in the comfort of your own home, allowing you to shop online with complete confidence. *A shipping and handling fee of $9.99 will apply for each 'try it for free' order which allows up to 3 rings. 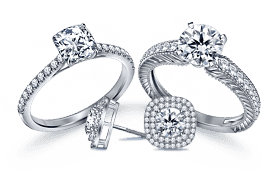 To use this service, add replicas of up to three selected rings to cart. Each replica will be a copy of the original ring made with silver alloy and 1 carat center diamond simulants. A shipping and handling fee of $9.99 will apply to each "try for free" order which includes up to 3 rings. After receiving the delivery of replicas, you have 7 days to try them on and decide your most favorite one. However, you are under no obligation to order from us. The delivered kit will also contain a prepaid return envelope. To return the replicas back to us, make use of the envelope and drop it off in the closest mailbox within 7 days of delivery. The kit will also contain a free Ring Sizer to check the most accurate measurement for your ring. However, it need not be returned. The original ring of your choice can be purchased through our website at any point of time following the regular procedure. If the returned replicas are not in the original condition, B2C Jewels can deduct $25 as charges for restoration. Shipping upgrade is possible to UPS Overnight for an additional fee of $10.00. For any questions regarding our 'Try It For Free' service, call our customer service at 1-866-522-2539. Alloy rings are not meant for extensive wear as they may cause allergic reaction depending on the wearer. This service is currently only available in the United States. 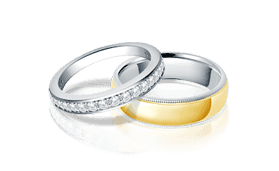 This service is limited to maximum of 3 replica rings per order, and a maximum of 2 orders per customer during a 12-month period. Vintage style and a nature motif make this diamond engagement ring stand out and shine. The nature inspiration is evident in the intricately detailed leaves that glitter with pave set diamonds. The band is set with diamond petals for a look that is fresh as a flower. The cathedral silhouette completes the beautiful simplicity. This setting is gorgeous and we need to make sure it is available in your ring size. Please get in touch with our jewelry experts to complete your order. Share this item information with a friend by filling the details below. Minimum Carat Weight(ct. tw.) : 0.24 cttw. Prices and availability are subject to change without notice. View our product policies for more information. We take pride in offering the best to our customer. We shall never fall short of an excellent presentation to our customers who buy jewelry with us. All items purchased will be packaged in a pretty gift box with our signature B2C Jewels ribbon. Please submit your comments and suggestions regarding our website. © 2004-2019 B2C Jewels. All Rights Reserved. The B2C Jewels Corporate Office is located in New York, N.Y.